Questions about the legality of a Port of Portland subsidy for ocean carriers have been kicked to the Oregon Supreme Court by a federal appeals court. The 9th U.S. Circuit Court of Appeals has ruled that the financial system used to manage the subsidy program isn't clearly legal under current Oregon case law. "We are hesitant to expand Oregon law in a manner that may be contrary to Oregon's wishes and in an important subject matter in Oregon's history," the ruling said. At issue is a Port of Portland program that paid ocean carriers to stop at its beleaguered Terminal 6 container terminal, offsetting the carriers' expense to call on the facility. The port created the subsidy because of alleged work slowdowns by the longshoremen's union due to a labor dispute that discouraged ocean carriers from calling on Terminal 6. 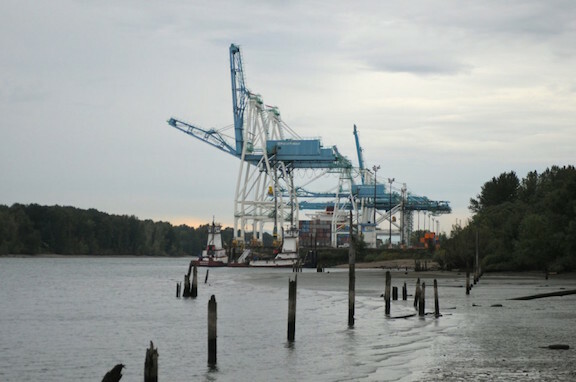 The International Longshore and Warehouse Union filed a lawsuit challenging the subsidy program for allegedly using taxpayer dollars for the benefit of private organizations, thereby violating Oregon's constitution. Northwest agricultural exporters depended on the Portland container facility to ship crops to Asia, but ocean carriers stopped calling on Terminal 6 in 2015 due to low productivity -- despite the subsidies. Local agricultural exporters are now saddled with greater transportation costs, as they must truck goods to Seattle-area ports, but the Port of Portland hopes to eventually restart Terminal 6. The dispute over the subsidy is part of a broader legal war between the port, the longshoremen's union and terminal operator ICTSI that's seen as hindering the resumption of container service. The Port of Portland argues the subsidy program is legal because the money is drawn from rent payments by ICTSI, not tax dollars. The ILWU counters that the subsidy program is impermissible because the funds were commingled with tax money in a single bank account. "The Port has demonstrated that, as a factual matter, its accounting and financial management systems adequately tracked, managed, and segregated the tax and non-tax revenues," the 9th Circuit said. Even so, Oregon legal precedents are silent on whether such accounting methods are allowable, the 9th Circuit said. If the Oregon Supreme Court declines to resolve the matter, the 9th Circuit is prepared to answer the question "according to our best understanding of Oregon law," the ruling said.